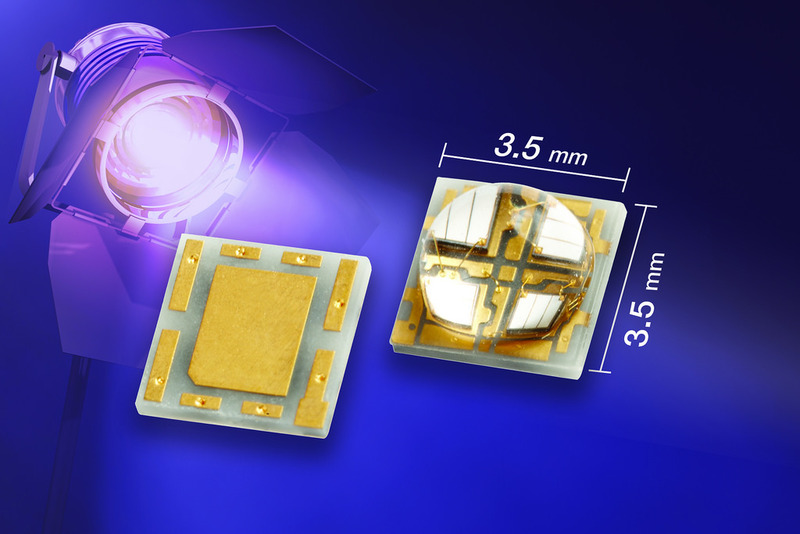 Vishay Intertechnology has introduced a new ceramic-based, high-power UV LED with a silicone lens. Designed to provide a reliable, energy-saving replacement for mercury lamps, the Vishay Semiconductors VLMU5200-385-140 delivers an exceptionally long lifetime in a 5.2mm by 5.2mm by 3.1mm surface-mount package for medical, industrial, and printing applications. The silicone lens of the VLMU5200-385-140 enables an extremely long lifetime compared with typical mercury lamps. The environmentally friendly UV LED is free of heavy metals and provides increased reliability with its shock resistance and immunity to degradation from frequent on/off switching. While mercury lamps require complex drive circuits and need two to 15 minutes to warm up, the VLMU5200-385-140 allows for the use of simple low-voltage circuitry and requires no warm-up period. Built on InGaN (indium gallium nitride) technology, the device released today features typical radiant power of 2500 mW at 500mA and 3600 mW at 700 mA in a wavelength range between 380nm and 390nm. The VLMU5200-385-140 offers a wide emission angle of 140° and provides radiant intensity of 1054mW/sr at 700mA. The LED's specifications make it suitable for UV curing in nail salon, dental, and poster printing applications; blood and counterfeit money detection; and photocatalytic purification. RoHS-compliant, halogen-free, and Vishay Green, the VLMU5200-385-140 is compatible with reflow soldering processes and features a Moisture Sensitivity Level of 2 in accordance with J-STD-020.